Tiramisu Truffles – a little twist on the classic tiramisu recipe. Here’s 2 versions one with and one without filling with nutella. These little truffles will be hard not to keep popping in your mouth! Enjoy! 1. Mix coffee with hot water and set aside until completely cool. 2. Crush the ladyfingers. 3. In a large bowl mix mascarpone with sugar when smooth add chilled coffee and vanilla extract. Mix until smooth. Add the crushed cookies and mix until combined. Put in freezer for 30 minutes. 4. 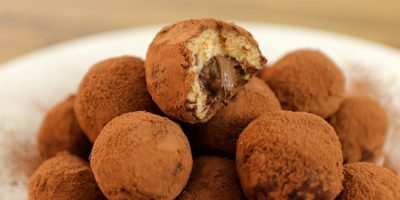 Take small amount of the mixture and roll with your hands into balls, then roll in cocoa powder. Or second potion: take small amount of the mixture in your hands and flatten it. Then add the Nutella in the middle, close and shape into ball. roll in cocoa powder. 5. Refrigerate for at least 2 hours before serving.